An anthropology beyond nature and culture? Tim Ingold and Gisli Palsson’s edited volume, Biosocial Becomings. Cambridge University Press, 2013, 288 pages. This essay originally appeared in Portuguese in the journal Mana. Translated by Daniela Ginsburg. Anthropology established itself as an independent discipline by designating the social as a specific field of study, allowing it to distance itself from certain retrograde positions found within the domain of physical anthropology. However, the nature/culture dichotomy on which this division was based has been the object of constant criticism over the past several decades. The two editors of Biosocial Becomings have, like Bruno Latour and Philippe Descola, demonstrated the limits of these concepts in explaining human representations and practices. Now that this deconstruction has begun, the challenge for our discipline is to define an anthropology “beyond nature and culture.” What principles must guide our research? What methodologies should ethnologists apply? Which concepts can render their results intelligible? Within the context of this vast enterprise of re-founding and re-developing, the panel organized by Tim Ingold and Gisli Palsson in 2010 as part of the EASA conference and entitled “Human Becomings: Beyond the ‘Biological’ and the ‘Social,’” sought to formulate theoretical propositions while also beginning to explore new objects. In the book that emerged out of this collective reflection, the project to “integrate the social and the biological” is synthesized by Ingold (in chapter 1, “Prospect”) and by Palsson (chapter 12, “Retrospect”), who establish a theoretical horizon for the enterprise. As for the rest of the pieces, their heterogeneity contains a certain ambiguity. On the one hand, this variety may be seen as evidence of the potential richness of studies that seek to better understand “biosocial becomings” by investigating a plethora of phenomena from across the world. But, on the other hand, this multiplicity raises some difficult questions: what place is given to biological processes in ethnographic studies? Should these studies use biomedical data or, instead, should they try to document, by other means, non-biological conceptions of living beings? What can ethnography of traditional societies contribute to knowledge of life? Although the various chapters in this work do not always explicitly answer such questions, they do at least present the advantage of delineating the problematics that the anthropology of life must address if it hopes to develop. Instead of thinking of evolution in terms of lineage, Ingold’s project is to emphasize the importance of “mutually conditioning relations”; interpenetration is just one possible modality of such relations, which shape the forms of beings that co-exist within the same environment. According to Palsson, the difficulty then becomes avoiding “disciplinary boundaries” (230 ff.) and the challenge is to develop “alternative theoretical languages” (238 ff. ); Rabinow’s notion of “biosociality” and Harraway’s “natureculture” offer good examples of such alternative theoretical languages. In keeping with this, certain seemingly neutral concepts must be abandoned: “It is essential to go beyond anthropocentric terms such as ‘competition’ and ‘cooperation’ which have characterized neo-Darwinian theory in several fields” (232-3). Once the bases of such an agenda have been established, one must specify the methodological principles by which ethnographic inquiry can construct and study objects located at the interface of nature and society. Taking off from the idea that “humans become human through relations with other becoming organisms and species and the environments within which they are embedded,” (244, italics in original), Palsson goes on to foreground the fertility of “multispecies ethnography” (Kirksey and Helmreich). The “anthropology of microbes” (Benezra, DeStephano, and Gordon), “the interconnected becoming of life in its more-than-human form,” and Eduardo Kohn’s project for an “anthropology of life”—re-baptized “anthropology beyond the human” —all make appearances here as ways to move beyond anthropomorphism and grasp the interactions between living beings within a holistic framework. Having said that, multispecies ethnography is far from being the only way of documenting “biosocial becomings,” as the diversity of the rest of the contributions brought together in this volume attests. Eugenia Ramirez-Goicoechea (chapter 4) and Agustín Fuentes (chapter 3) both explore the epistemic implications[iii] of notions such as “niche construction” and “multiple inheritance”[iv] for biological anthropology in order to emphasize the importance of taking human activity into account in evolutionary processes. Ramirez-Goicoechea reminds us how advances in epigenetics have led to abandoning a kind of unilateral determinism that is sometimes expressed in discussions of genes: “Gene-centered biology and its related disciplines do not consider the organism (or any other unit) as a co-building agent of its surroundings but rather as a passive recipient of evolutionary forces” (69). In contrast, “the concept of niche construction captures this complex autopoietic process of action in evolution” (ibid.) and sheds new light on, for example, the socialization of children (71). Similarly, Agustín Fuentes writes : “in the new approach I am suggesting here, the static, evolved, endpoint drops away and the focus becomes on how we are evolving in the past and present” (46). Bipedalism, stress, pair bonds, and co-operation are mentioned as examples of phenomena that “biosocial becomings” may fruitfully analyze. The editors of Biosocial Becomings, as well as the authors of the two chapters discussed above, state that their intentions are to integrate cultural phenomena into the biological study of human populations. However, it is my view that such a disciplinary rapprochement raises certain methodological and deontological problems. Although one cannot but agree in theory with the desire to bring together as many elements as possible in order to understand human phenomena in all their depth, one must not forget the intrusive and objectivizing aspects of biological data collection. How can an ethnographer using participant-observation gather information for understanding processes as complex as those explored by epigenetics? Saying that anthropologists should work in teams does not solve the problem—wouldn’t such a division of labor risk reintroducing the dualism that was supposed to have been left behind? Although the authors in Biosocial Becomings go to great pains to demonstrate the importance of epistemologically and ontologically integrating disciplinary fields and the concepts they produce, little indication is given of how anthropologists are actually to proceed. From one chapter to the next, not only does the ground covered change; most significantly, the place given to biological knowledge by the various authors does. Within the field of medical anthropology, bridges between the disciplines were built long ago; the task was made easier by the fact that biomedical data and even bio-products (blood and DNA samples, for example) pre-exist anthropological inquiry, freeing the ethnologist from the responsibility of having to take samples him- or herself. This is the case in Aglaia Chatjouli’s chapter on the lives of people with thalassaemia, a monogenic disease requiring patients to undergo regular blood transfusions. Chatjouli’s fieldwork in blood transfusion centers allows her to construct an analysis around the “dynamic role of biosciences in reconfiguring (human) nature” (86). Taking inspiration from Ingold, she explains that she has tried “to illuminate thalassaemic lives in terms of persons-organisms living in an environment (88, italics in original). She emphasizes that a new definition of living beings emerges out of the chronic imbrication of vital and technological processes: “embodiment of transfusion [is] the most prominent and life-long act of biomedical mediation…[it] is paradigmatic of the naturalized biosocial making of the organism” (90). The biological dimension of human existence turns out to be irreducible to genetics and “intrinsically tied to human action, as a developmental and relational process, constantly in the making” (105). From another point of view—in another “mode of veridiction,” Latour would say—anthropology can study the legal controversies raised by the eruption of new bio-materials into the social space. Here again, social scientists—like jurists—arrive after the battle, so to speak, and ethnologists are not required to themselves collect the data being debated. The goal is to bring out the ontological and political implications of the legal reasoning used to qualify objects that have never before existed in human history. Gisli Palsson discusses, for example, the debates that led a judge in the United States to invalidate patents on two human genes, BRCA1 and BRCA2, mutations of which have been associated with breast cancer (235). Noa Vaisman’s contribution to the volume (chapter 6) addresses this question by examining the implications of a decision by the Argentinian Supreme Court in a case involving identity tests on shed-DNA. During the military dictatorship of the 1970s, the children of hundreds of political opposition members were separated from their parents and then secretly given to other couples with new identity papers. In addition to the emotions this practice still stirs up, complex problems are raised when the judicial system seeks to restore these children’s identities and familial ties. In the case discussed by Vaisman, a (non-biological) family refused to allow a blood sample to be taken from their child Guillermo. When Guillermo reached adulthood, he too refused to have his blood tested—a good illustration of the resistance humans may use to oppose bio-sociological explorations of this kind. Ultimately, the Supreme Court decided to use Guillermo’s personal possessions to extract enough “biological material” to make a decision. Leaving the deontological problems raised by this intrusive sampling to the side, Vaisman investigates the ontological status given by the legal system to these materials, which “while belonging to his [the appellant’s] body, had been detached from it at the moment of confiscation” (110). Vaisman, who also draws on Ingold, proposes treating the human “as an assemblage of environment-organism-humans: a human whose boundaries are always open to the world and whose existence is enmeshed with its surroundings” (113). In this context, “‘shed’ DNA is in fact not shed at all but rather an extension of our body-self, which exists in and through our environment” (114). His study of the various conceptions of personhood that emerge out of the Court’s written decision leads him to conclude that “The Supreme Court’s ruling seems to oscillate between two visions of the subject: the subject as a product of genetic ties and the subject as a product of his or her social world” (116). This kind of decision will become increasingly frequent as human powers over living beings grow, and anthropology will find in these decisions material on the basis of which to trace how reconfiguring the status of persons deeply alters social organizations. This opens the door to new types of analysis, in which sociological explanations will have to incorporate biological data whose status (prescriptive, descriptive, agentive) will vary depending on how knowledge is constructed. The question of how to bring the disciplines together is not the only one addressed by this book. Whereas the developments I have just been discussing rely on using biomedical data, this is not the case in other chapters, which use the concept of the “biosocial” to tackle the problematic of the living, with authors either situating themselves in the tradition of Ingoldian phenomenology or trying to highlight the specificity of certain non-Western ethno-theories of life. Several pages are dedicated to describing the working of the sawmill, in order to “sensitiz[e] the anthropologist’s—and the reader’s—perception to the flux and movement of real-life becomings” (189) by connecting the sawmill to the vast environment within which organisms and materials co-exist. I leave it to the reader to explore the path taken here, which is accompanied by photographs reproduced by the authors. Though this approach is not without intellectual charm, it raises the question of the contribution that non-Western ethnography can make to the knowledge of life. To the extent that there is, at the heart of Ingold’s project, an ontological thesis of what life is, we may wonder whether studying various human conceptions of life is still important. Isn’t there the risk that ethnographic data depicting emic understandings of life will end up playing second fiddle to a universal conception of vital élan, which ethnologists would then go about detecting in various environments? Other chapters focus not on this phenomenological approach—within which “openness to the world” is never enough to guarantee against the risk of solipsism—but rather on the ethno-theories that classical methods of fieldwork bring to light; this is the case, for example, with Istvan Praet’s chapter, which returns to the central thesis of his work Animism and the Question of Life (2013). Basing himself on his ethnographic experience among the Chachi of Amazonia, Praet proposes interpreting animism not as an extensive manner of attributing life to a multitude of beings but, rather, as the tendency to create a restrictive understanding of this quality. The originality of Praet’s thesis is to bring ethno-theory into relation with the restrictive representations of humanity held by many different peoples. As Lévi-Strauss explained in Race and Culture, and as the table showing “the worldwide occurrence of restricted humanity” (196-8) demonstrates, it is common for groups to consider themselves the “true humans” and to exclude their neighbors from the sphere of humanity. Similarly, Praet’s subtle argument, which I will not try to trace here, shows that animist conceptions rest on principles of opposition that do not set the boundaries between living and dead at the same places as Western biology and cosmology. In short, one can say that these groups’ ethno-theory arrives by its own route at a type of formalization that does not conflict with the latest discoveries of Western science. When ethnographic studies seek to render ethno-theories, the goal is not to establish their possible correspondences or discordances with scientific theories, which are subject to paradigm changes. If we wish to truly access the movement of theorization at work in these ethno-theories, it is essential to deconstruct the concept of life. Palsson rightly emphasizes that anthropology, instead of mechanically repeating expressions that have over time become near-clichés (Rose’s “life itself,” Agamen’s “bare life”), must refine its analytical categories by studying “life as such” (Fassin), without forgetting Canguilhem’s distinction between “the living” and “the lived” (242-3). I would go further still, and suggest that “life” is not a unitary phenomenon, and that if we wish to be precise, we must specify which vital process we are referring to when we speak of life: reproduction, growth, regeneration, movement, or relation to the environment, to name but a few examples. Furthermore, it seems to me that anthropology must pay more attention to the distinction between the living (a multiplicity of processes that are manifested in a multiplicity of beings) and life, understood as a set of causes produces these processes. Numerous ethnographic facts prove that among Western and non-Western peoples alike, the theorization of life often consists in imagining life as a making; thus, I have proposed studying life within the framework of a “general pragmatics”[v]. The challenge then becomes to reflect on the various ways of conceptualizing this activity. The data collected by Gaetano Mangiameli in the Kasena chiefdom of Paga, in Ghana, helps make this issue clear. Though Mangiameli’s analytic framework (expressed in terms of flux and “whirls of organisms” ) owes a great deal to the Ingoldian vision of the world, there are differences—and therefore complexities—that make clear the uniqueness of the Kasena’s relationship to the world. By foregrounding a pragmatic understanding of their sacred groves, he considers how the quality of agency is attributed to non-humans (“It is therefore necessary to assume that things must be described in terms of what they do, or in terms of how they are made and re-made, and furthermore, in terms of how they make themselves” (147). In this framework, accounts of the creation of the world—whether by autopoiesis or by the intervention of a demiurge—constitute interesting objects to examine as concretizations of local theories that explain the organization of the living through the intervention of non-human agents (151). Along the same lines, the description of altars (puru)—sorts of piles gradually fashioned by the inhabitants of a compound—illustrates how vital processes are represented: “In the same way as compounds can grow, decline, and sometimes disappear, the heap can grow or decline, depending on the intersection of atmospheric conditions and demographic trends in the compound” (153). Technical actions play a crucial role here since “the puru is built every day, slowly, through marginal acts. Basically, the puru is a heap made of waste: it is the place where, every morning, women pile up dust and rubbish after they finish sweeping” (153). Mangiameli concludes by saying that “The puru embodies the centrality of life-in-the-making in a West African philosophy of becoming (153-4). The originality of the positions defended by the editors of this work and the diversity of the fields explored by its contributors make Biosocial Becomings a crucial work for current debates in anthropology. The epistemological and methodological problems it raises will not fail to revitalize thinking around the nature/culture opposition and will contribute to the project of theoretical transformation currently underway in our discipline. [i] On the basis of a similar ontological thesis and the same rejection of the notion of design Ingold develops an original approach to technical activity, seeing it as the continuation of the vital movement that gives form to artifacts. According to him, from the point of view of morphogensis, it is wrong to think of making and growing, artifact and organism as opposites. [ii] “[Evolution] can only be understood topologically, as the unfolding of the entire tapestry—of the all-embracing matrix of relationships wherein the manifold forms of life that we call ‘cultural’ emerge and are held in place. Within this matrix, the becoming of every constituent both conditions and is conditioned by the becoming of other constituents to which it relates” (8). [iii] “Epigenesis is key to the post genomic shift from genetic determinism to a focus on the interactional networks of stochastic genomic processes in environments of development. This shift is fundamental to a biopsycho-sociocultural approach to human becomings and to showing how life is in-the-making” (80, italics in original). [iv] “Niche construction theory suggests that humans and their environments are mutually interactive participants in the evolutionary process through ecological inheritance. Multiple inheritance theory proposes that evolutionarily relevant inheritance can take place at genetic, epigenetic, behavioral and symbolic levels” (53). The analyses of “multiple inheritance” are based in particular on the works of Jablonka and Lamb published in Evolution in Four Dimensions (2006). [v] Perig Pitrou, 2014. « Life as a process of making in the Mixe Highlands (Oaxaca, Mexico). Towards a ‘general pragmatics’ of life », Journal of the Royal Anthropological Institute (http://onlinelibrary.wiley.com/doi/10.1111/1467-9655.12143/abstract). [vi] Perig Pitrou 2014, « La vie, un objet pour l’anthropologie ? Options méthodologiques et problèmes épistémologiques », L’Homme, 212. [vii] Other quotations : “Cells under stress may mobilize systems that reshape their DNA by turning genes on and off (cf. Jablonka and Lamb 2005: 88)” (28); “According to the growing field of nutritional epigenetics, as Landecker points out (2011: 177), “food enters the body and never leaves it, because food transforms the organism’s being as much as the organism transforms it” (29-30); “Moss (2003) suggests such a pragmatic perspective to theorize life beyond codes and genes”; instead of genes, he emphasizes that “‘it is the living organism, as an active agent of its own adaptative ontogeny and evolvability, that is once again poised to move back into the ontological driver’s seat’ (Moss 2003: 198)” (32-3). Book Forum—Anand Pandian's "Reel World: An Anthropology of Creation"
Pitrou P. An anthropology beyond nature and culture? Tim Ingold and Gisli Palsson’s edited volume, Biosocial Becomings.. Somatosphere. 2015. 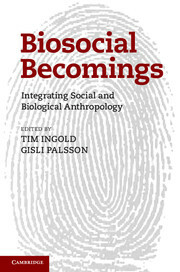 Available at: http://somatosphere.net/2015/an-anthropology-beyond-nature-and-culture-tim-ingold-and-gisli-palssons-edited-volume-biosocial-becomings.html/. Accessed April 26, 2019. Pitrou, Perig. 2015. An anthropology beyond nature and culture? Tim Ingold and Gisli Palsson’s edited volume, Biosocial Becomings.. Somatosphere. http://somatosphere.net/2015/an-anthropology-beyond-nature-and-culture-tim-ingold-and-gisli-palssons-edited-volume-biosocial-becomings.html/ (accessed April 26, 2019). 3 Responses to An anthropology beyond nature and culture? Tim Ingold and Gisli Palsson’s edited volume, Biosocial Becomings. Where find the texte An anthropologist looks at biology ( T. Ingold,1990)?